Somewhere between Hollinwood and Failsworth, the 4.2% rise will fund extra trams – and possibly TfGM’s £42million legal bill against Thales, as well as the forever delayed East Manchester Line. To get the best out of this article, I recommend you read my previous one in conjunction with this installment. In the previous article, I looked at the impact on rail and tram fare increases on individual travellers, and compared fares with taxi rates and motoring costs. The general conclusion of that article was that travelling to Manchester on public transport – even with its shortcomings – was cheaper than driving. The overall cost, even in the most economical of cars was offset by insurance premiums and long stay parking. If he or she chose to drive from home to a smaller town in Greater Manchester, the savings would have been modest. Again, offset by parking costs, particularly so in regional centres like Stockport, Ashton-under-Lyne, Bolton and Wigan, and less so in smaller towns like Woodley, Dukinfield, Farnworth and Hindley. The same four destinations used in the previous article will be used to ensure fair comparison. Again, the 2008 Ford Ka will be used as our private car. For a family unit, the car – if shared amongst family members and pooled sensibly – makes for a cheaper alternative to buses, trains, taxis and trams. The driver could choose his or her soundtrack, whether it is Adele’s 21 or In The Night Garden without disrupting other passengers. Cars may offer convenience, but if the child is whisked everywhere by car, they lose out on a number of important life skills. These are: 1) being able to read a timetable; 2) knowing how to board public transport; 3) planning journeys efficiently, and 4) understanding our arcane fare systems. In Greater Manchester, family fares have only been around across all modes for the last half decade. National Rail – and British Rail before then – has offered discounts for family members since the mid-1980s. This followed on from BR’s successful introduction of Elderly Persons’, Young Persons’ and Disabled Persons’ Railcard. In recent years, restrictions for their discount cards have been tightened with emphasis on avoiding peak hour overcrowding. Furthermore, the Family and Friends Railcard has seen its child reduction slashed, eliminating the maximum child fare of £2.00. Metrolink Family Day Saver: £6.70 (all trams within Greater Manchester, after 0930 on weekdays and all day weekends and bank holidays). Family and Friends Railcard: £28, one year (or £65 for three years, purchased online) – 33.3% off adult fares and 60% off children’s half fares – valid for up to four adults and four children. Please note that a family version of the Greater Manchester Rail Ranger isn’t available. Train (after 0930): £10.85 (£7.10 with Family and Friends Railcard discount). Far and away, the car is our cheapest option for the family of five – like one-tenth of the rail fare – and a seventh of the price of a FirstDay Family and Friends. Again, the bus option is more viable if the family group decide to travel further afield into Rochdale, Burnley, Todmorden or Halifax. The only mode of transport more expensive than the other three is the taxi. By train, the railcard discount brings off-peak and peak hour fares to a level below that of First West Yorkshire’s FirstDay Family and Friends ticket. Train (after 0930): £6.30, off-peak return (£5.20 with Family and Friends Railcard discount), £3.15 Evening Return. Quelle surprise, the car is the cheap option again in terms of travel, but not so cheap when our motorist wishes to take the family to The Print Works or Manchester Arndale. By then, exorbitant parking fees come to the fore. Therefore, a Stagecoach Manchester bus with a Group Dayrider ticket is a more competitive option. Failing that, The Trafford Centre’s free parking makes for a cheaper option for motorists. Cheaper still – particularly after 0930 or all day weekends and Bank Holidays – and definitely after 1830 – is the train. With its 10 minute journey time, there’s barely enough time for the strains of ‘are we nearly there yet’ compared with being stuck at Hyde Road. On Hyde Road, the bus is a good option if you’re on a budget, patient in peak hours and prefer a service with a more substantial frequency (201s and 203s make for a bus every five minutes – excluding less frequent 204s, 206s and 207s). Once more, the taxi is our more expensive option, even with the worst excesses of city centre parking fees, and the low cost of Stagecoach’s Group Dayrider and parallel rail fares. The railcard discount – before and after 0930 – makes for the cheapest option on public transport. Taxi (five people): £33.50 (£67.00 return). The train between Huddersfield – Stalybridge cannot be faulted for speed, but its fares remain a bone of contention (which I why I say ‘A Not So Cheap Day Return to Huddersfield’ to my friendly ticket clerk if making that journey). Unsurprisingly, the car is our most cheapest option, though not so cheerful over Marsden Moor on a rain, hail, snow or ice lashed A62. The rail fare for two adults and three children is a wallet pummelling £37.10, or £42.35 before 0930. For another £25, you could get a return journey by taxi. With a Family and Friends railcard, they are a more accessible £20.00, or £22.90. Even so, the discounted option is three times the price of a FirstDay Family ticket on the 184 and 353/354 routes. What you gain by rail is its more frequent all day service, faster journey times and a direct route (no changing at Uppermill compared with the bus option). 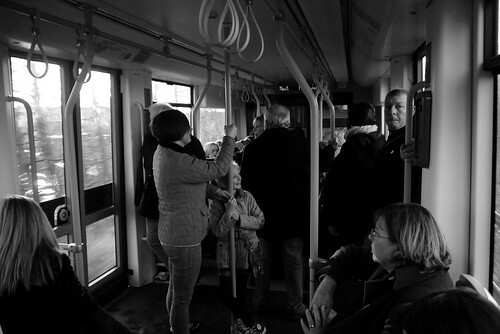 Tram (after 0930): £6.70 (Metrolink Family Day Ticket). Once more, the car is the cheapest option, even with the addition of Trafford Council’s parking charges. This is true if the journey is made before 0930. After 0930, and in the weekends and bank holidays, discounted tram and train fares are a much cheaper alternative. Before 0930, there are no family tickets available on the Metrolink, with the fare for two adults and three children £27.90. After 0930, the £6.70 Family Ticket is the cheapest way between Manchester and Altrincham – and the most flexible given its high frequency. Though less frequent, the rail fare is £21.35 or £13.30 (being £11.55 and £8.00 with the Family and Friends Railcard). Slower though cheaper than the tram and train in peak hours, is the bus. System One’s Group DaySaver allows travel on all buses in Greater Manchester for our quintet at £10.50. If fed up with Altrincham, our group could board the 18 to Manchester Airport, 19 to Sale, or go to Manchester on Stagecoach Manchester’s 41, instead of Arriva’s 263. It seems as if till recently only individual passengers could benefit from the array of day rover tickets and season tickets. Recent history has seen the launch of family friendly day saver tickets at a lower price than the Group Wayfarer with bus and tram specific tickets saving passengers money with reduced boarding times a knock-on effect. Within Greater Manchester, a family of five can travel quite cheaply on System One’s range of day rovers if making a journey more than five miles. City centre and town centre parking rates make journeys within the TfGM boundary by car a more expensive proposition. Hence the success of The Trafford Centre and retail parks on the edge of town centres. Supposing we travel outside of the TfGM boundary towards West Yorkshire, the car is a cheaper option, even with Kirklees/Leeds/Calderdale/Bradford/Wakefield councils’ parking rates. Especially so between Stalybridge and Huddersfield where the unsubsidised section from Greenfield to Marsden has a marked affect on fare rates. It is still a dear do between Stalybridge and Huddersfield by rail after Family and Friends Railcard discounts. Particularly galling is that the peak hour return fare is only £25 less than the equivalent journey by taxi! If your family uses the train often enough, it pays to go for the Family and Friends Railcard. Casual users, if travelling as a family, may be best sticking with their car on cross-boundary journeys. If your family makes most journeys inside their borough or PTE area, consider weekly, monthly or annual season tickets. Where possible, opt for one which covers more than one operator. In the previous post, we stated how public transport was a more viable option for lone passengers. Families, in most cases, travelling to locations outside Greater Manchester, may be best sharing the family car. In some cases, two cars may be needed as each adult (again using our five member family group as example), but the additional costs of a second car may be more expensive than two adults purchasing bus, rail, tram or multimodal season tickets. The happy medium of using the car for occasional trips and bus/train/tram season tickets for work based commuting could be a good idea for Greater Mancunian households. Even so, the convenience of the car – in spite of rising fuel and insurance costs – remain a popular option for all family groups. Whereas the cost of peak hour commuting is expensive enough for single persons, family groups falling foul of peak hour restrictions – thanks to the school run and hospital appointments – are hit even more. What’s more, there’s nobody sat behind you wondering why your child is laughing at Macca Pacca. Likewise with mum or dad trying to warble Someone Like You pretty badly. What’s more, we need to make public transport fares more competitive for family groups. Not only for groups wishing to travel from Denton to Westhoughton, but also groups making more modest journeys (like Denton to Hyde or Haughton Green). This problem isn’t the sole preserve of rail based traction, but the UK’s public transport network in its present form. Which also explains why the car is seen as the cheaper option. Out of the EU Member States, it is no surprise as to why Britons are the most fervent online shoppers. The current problem with many group tickets is that they assume that there is at least one child travelling with the party. So it’s nice to see that bus operators are starting to cater for adults travelling together, who might otherwise use the car – the First West Yorkshire Family & Friends ticket (up to five) and also the Network Warrington Group Day Rover ticket (up to four) are good examples. I am glad to see that First West Yorkshire and Network Warrington favour adults travelling together as well as the usual two adults and three children. I would be happy if more incumbent Group day rover tickets allowed this throughout Greater Manchester (TfGM’s Group Wayfarer remains the exception to that rule). Therefore, what equals two adults and three children, could be equal to three adults and a child – or four adults with a discount per head for travelling as a group. As well as making family travel by bus more affordable, it is also good for the night-time economy as a viable alternative to the taxi. Adult passengers (without season tickets) having a few scoops or visiting the theatre – also likely to be doing both activities – would be more able to forget the car. First Manchester’s short lived First4 ticket (similar to First West Yorkshire’s) was a good idea some time in 2003 but it didn’t catch on, being an evening only offer. Re-nationalisation is the only answer to this problem. In order for a private company to keep fares low, they either have to reduce their profits or reduce their service. Since they’re all about profit then all you see is a deterioration in service along with an increase in fares. That’s capitalism! The only problem with a nationalised structure under present company in Westminster, is that they would retain the status quo and try to run it along similar lines to our Big Bus Owning Groups’ operations. They may continue the profit motive instead of the pluralistic social service aspect which PTE operators did and municipal operators do today. Public sector operators may be subject to the same spending cuts as of now (case in point: 2010 saw Network Warrington make severe cuts to Sunday and Bank Holiday services). I wouldn’t trust the ConDems with a Hornby clockwork train set, let alone the nation’s bus routes!